The April 2016 “Springtime” Limited Edition Fennux Coat is here! FOR REAL. NOTE: THE LE ILLUSION EYES ARE VERY RARE, DO NOT EXPECT TO GET THEM, BUT IF YOU DO GET THEM – CONGRATULATIONS! And that’s all there is to it! Enjoy your Springtime LE Fennux Den, and your 12 Days of Reserve Food! WHERE DO I GET MY SPRINGTIME LE FENNUX? The Wishing Well exists only on the Fennux Sim. We have 1 setup next to every Crafting Machine, and of course these Wishing Wells are used to turn any 12 Fennux Dens into 1 Springtime LE Den (and 12 days of Reserve Food). Yes there is a SMALL CHANCE to get “LE Illusion Eyes”, but the odds are roughly about a 0.5% chance to obtain, so don’t expect to get them! The LE Illusion Eyes can pass onto other coats, so even if you don’t get them from Wishing, you will have opportunities to obtain them in the Secondary Market later. Most Fennux however will have regular eyes from a starter den, very similar to Crafting – the only thing that is “LE” on most Springtime LE Fennux is the over-ride of the Fennux Coat. It’s more-or-less exactly like Crafting, except for the fact the coat will not pass. As you all may know, we at Team Fennux have been very busy with Fawns – so busy that we had to ask our texture artist, Katharine, to stop creating LEs for Fennux. BUT DON’T WORRY, Daemon is obviously an excellent texture artist. He has been using Microsoft Paint since Windows 95! And not to mention his excellent finger painting ability since the age of 4. Long story short? Daemon’s got you covered. Check out this amazing LE. Heck, if you ask me – I think this is better than our previous LEs. This is obviously Daemon’s new calling. Fawns will continue to be worked on by Katharine, but Daemon will be taking over with his excellent texture creating abilities for Fennux. Can’t wait to see those T9s that Daemon has made. The April 2016 “Springtime” Limited Edition Fennux Coat is here! The March 2016 “Kiwi” Limited Edition Fennux Coat is here! And that’s all there is to it! Enjoy your Kiwi LE Fennux Den, and your 12 Days of Reserve Food! WHERE DO I GET MY KIWI LE FENNUX? The Wishing Well exists only on the Fennux Sim. We have 1 setup next to every Crafting Machine, and of course these Wishing Wells are used to turn any 12 Fennux Dens into 1 Kiwi LE Den (and 12 days of Reserve Food). Most Fennux however will have regular eyes from a starter den, very similar to Crafting – the only thing that is “LE” on most Kiwi LE Fennux is the over-ride of the Fennux Coat. It’s more-or-less exactly like Crafting, except for the fact the coat will not pass. The February 2016 “Valley” Limited Edition Fennux Coat is here! NOTE: THE LE MELONSPARK EYES ARE VERY RARE, DO NOT EXPECT TO GET THEM, BUT IF YOU DO GET THEM – CONGRATULATIONS! And that’s all there is to it! Enjoy your Valley LE Fennux Den, and your 12 Days of Reserve Food! WHERE DO I GET MY VALLEY LE FENNUX? The Wishing Well exists only on the Fennux Sim. We have 1 setup next to every Crafting Machine, and of course these Wishing Wells are used to turn any 12 Fennux Dens into 1 Valley LE Den (and 12 days of Reserve Food). Yes there is a SMALL CHANCE to get “LE MelonSpark Eyes”, but the odds are roughly about a 0.5% chance to obtain, so don’t expect to get them! The LE MelonSpark Eyes can pass onto other coats, so even if you don’t get them from Wishing, you will have opportunities to obtain them in the Secondary Market later. Most Fennux however will have regular eyes from a starter den, very similar to Crafting – the only thing that is “LE” on most Valley LE Fennux is the over-ride of the Fennux Coat. It’s more-or-less exactly like Crafting, except for the fact the coat will not pass. BEFORE YOU UPDATE YOUR FENNUX/DENS, Please understand that any Fennux or Den set for sale will NOT retain it’s “set for sale” status, or the price you set it for sale. Second Life does NOT give us the tools to store this data and set it back for sale upon updating. You WILL need to manually set any Fennux or Den for sale again after updating, and put it’s price. YOU HAVE BEEN WARNED! Haha. So, we’ve been working on this for a while – and now it’s finally ready. 1.) Added a Fix for Tiny Body Prims – This happened to some user’s Activity 0 Fennux, it happened to Fennux that were growing up/getting bigger, some body parts would stay small and others would grow. 2.) Fully Automatic Redelivery Portal – You can queue up as many Fennux as you want for redelivery on the website, then press 2 clicks on the portal to automatically receive them all in-world. (Previously, it was 3 clicks for every 1 fennux you wanted to redeliver, now it’s 2 clicks for all of the queue.) I can’t express how awesome this is compared to our old method. It’s literally fully automated. 3.) Recipes Every 5 Days – Our code previously calculated the recipe rez time so it was something like 12 or more days for tier 6, 7, and other higher tiers. Now every tier level fennux rezzes recipes every 5 days. 4.) Fixed Running Pet Stack Heap Collison Script Errors – Second Life broke a few of our scripts ages ago that had to do with animating the Fennux when used as a Running Pet. We managed to find a fix for it! 5.) Added a “Fix All Clones” Button to the Website – Ever have a bunch of Fennux cloned at once? Now you can fix them all at once. This is much easier than manually looking up each ID to fix, one at a time. Pretty awesome. 6.) Added the ability to toggle ON or OFF the Fennux Ball Chasing / Fennux Ball Rezzing – People have been messaging us for some time now about how they want to be able to disable the Fennux Ball Chasing. Now you can! Just change the option on the Settings page of My Fennux to Disabled. 7.) Fixed the Fennux.com/ID pages so that they load instantly – In the past it would take a minimum of 5 seconds to load the ID pages. This was taxing on our database server as well the patience of our breeders. Watch as your fennux.com/ID pages load super quick! 8.) NPC Pets / Eternal Pets on Web Market no longer Un-Pose upon a Sim Restart – In the past, if you would set a pose for an Eternal Pet or NPC Pet, and the sim would restart – the pet would un-pose and be standing. This no longer happens! 9.) NPC Pets Stopped Functioning when Redelivered – This is something we didn’t even know existed, I guess since most people would simply rebuild the NPC if it was not working after a redelivery. Either way, we fixed this issue so that you won’t have to rebuild these anymore after having it redelivered. 10.) Fixed a lot of other Stack Heap Collisions - We have had reports of stack heap collisions during dueling, and were able to smash these problems with a hammer. You may notice one occasionally, but from our testing they are no longer showing up for us. This update was primarily focused on fixing a lot of annoying little issues, but a bunch of little issues in our eyes was one big issue, which deserved a proper update. This is also why we went with calling it Version 3. HOW DO I UPDATE MY FENNUX TO V3.0? Open up “The Fennux” group in SL, then click the “Notices” tab to view the past group notices. 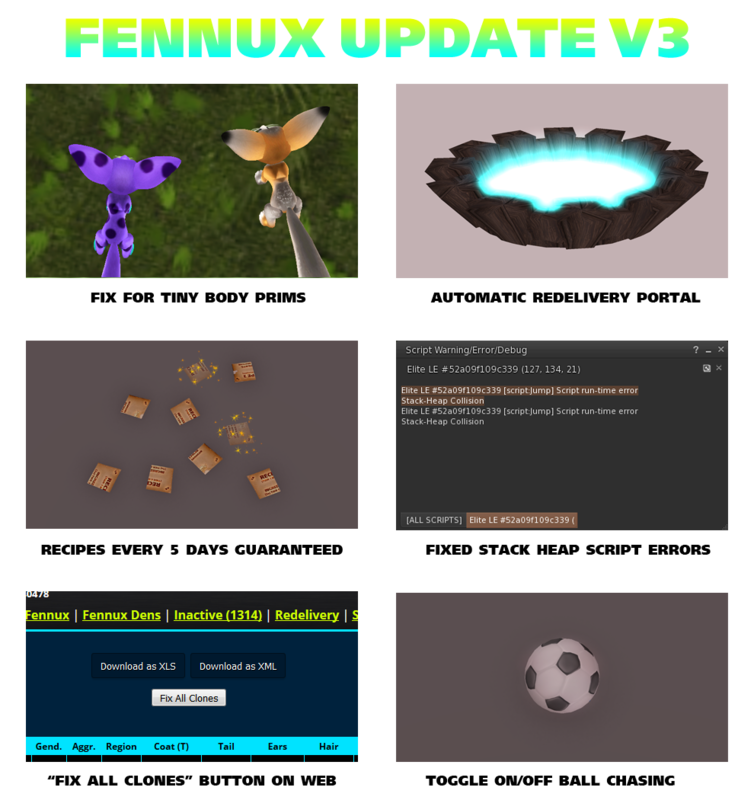 Click the post regarding “Fennux Update V3″, then look for the attached item “Fennux V3.0 Pyramid – Updater, Portal & HUD”. Click “Open Attachment” to copy it to your SL Inventory. OR, you can visit the Official Fennux Sim and touch the sign to get the updater that way if you find the main method troublesome. After you have the “Fennux V3.0 Pyramid – Updater, Portal & HUD”, rez it on your land and click it, then accept the inventory offer. It should have created a folder inside your inventory called “Fennux V3.0 Pyramid – Updater, Portal & HUD”, it’ll be in your recent items tab. Drag-and-drop the “Fennux Updater V3.0″ out onto your land. Click the “Fennux Updater V3.0″ that you just rezzed, and press “Yes” to begin the update process. This will only update Fennux that are currently on the sim you are on. If you have multiple sims where your Fennux are rezzed, you will need to visit each different sim and repeat this process. The updater will let you know when it’s all done. So click it once and then wait. It’s slow, but guaranteed to update all of your Fennux on that sim automatically. EVEN if the Fennux are split up 4000 meters up in the air AND on the ground. It’s fairly intelligent in that regard. Alternatively, if you do not have a lot of Fennux on a sim, you can use your “Fennux HUD V3.0″ to Rebuild each of your Fennux, instantly making them V3.0 as well. The updater is recommended for large amounts of Fennux, it’s a slow but seamless process, tried and tested by thousands of breeders. That’s it for this update. We do have other things in the works, but for now we hope this will hold people over until such a time. Thanks everyone! The January 2016 “Blizzy” Limited Edition Fennux Coat is here! And that’s all there is to it! Enjoy your Blizzy LE Fennux Den, and your 12 Days of Reserve Food! WHERE DO I GET MY BLIZZY LE FENNUX? The Wishing Well exists only on the Fennux Sim. We have 1 setup next to every Crafting Machine, and of course these Wishing Wells are used to turn any 12 Fennux Dens into 1 Blizzy LE Den (and 12 days of Reserve Food). Most Fennux however will have regular eyes from a starter den, very similar to Crafting – the only thing that is “LE” on most Blizzy LE Fennux is the over-ride of the Fennux Coat. It’s more-or-less exactly like Crafting, except for the fact the coat will not pass. As the title and picture say – yep, we’ve been around for 3 years now. Let that sink in for a bit. Three Years. That’s a long time. A good number of you have actually been here since day one, and we thank you for that. Seriously, thank you. …But words aren’t always enough. In celebration of this event, we are slashing prices on all items in half. 50% off everything we have in a vendor and on the SL Marketplace. This includes food/kibbles, one-time-use items like eternal pet crystals, hydrated homes – everything! The one exception is Reserve Food, we slashed it from L$7 per day down to L$4 per day, which is still 42% off mind you! Well, we’re doing this for a whole week, so you have time to get in on the savings – even if you’re already stocked up on kibble and such. We are not going to be refunding anyone half of their expenses because the deal didn’t exist yesterday, the deal starts now! For years I have heard people ask if they could get a Healer Fennux as a real coat, on a real Fennux. At least on a grabber or something simple. So, in honor of our third year anniversary, we have added a new FREE Running pet to the mix. Introducing the Fake Healer Running Pet, available on SL Marketplace: Click here to get your Healer Running Pet. Team Fennux wishes you all a wonderful holidays, and we hope that you had a great Thanksgiving (if you celebrate it), and here’s to another great year of breeding! The December 2015 “Bleu” Limited Edition Fennux Coat is here! And that’s all there is to it! Enjoy your Bleu LE Fennux Den, and your 12 Days of Reserve Food! WHERE DO I GET MY BLEU LE FENNUX? The Wishing Well exists only on the Fennux Sim. We have 1 setup next to every Crafting Machine, and of course these Wishing Wells are used to turn any 12 Fennux Dens into 1 Bleu LE Den (and 12 days of Reserve Food). Most Fennux however will have regular eyes from a starter den, very similar to Crafting – the only thing that is “LE” on most Bleu LE Fennux is the over-ride of the Fennux Coat. It’s more-or-less exactly like Crafting, except for the fact the coat will not pass. Get It Here While You Can! Since this is a Limited Edition product, we are going to retire it very soon. Within a week from this post being made – this LE Holdable / Runnable will no longer be made available to obtain. Make sure you get it within the next week if you have not already. Know someone interested in Firestorm or Fennux that might not have it? Let them know! Thanks again to Firestorm for making such a wonderful SL Viewer. The November 2015 “Chocomint” Limited Edition Fennux Coat is here! And that’s all there is to it! Enjoy your Chocomint LE Fennux Den, and your 12 Days of Reserve Food! WHERE DO I GET MY CHOCOMINT LE FENNUX? The Wishing Well exists only on the Fennux Sim. We have 1 setup next to every Crafting Machine, and of course these Wishing Wells are used to turn any 12 Fennux Dens into 1 Chocomint LE Den (and 12 days of Reserve Food). Most Fennux however will have regular eyes from a starter den, very similar to Crafting – the only thing that is “LE” on most Chocomint LE Fennux is the over-ride of the Fennux Coat. It’s more-or-less exactly like Crafting, except for the fact the coat will not pass.